i have climbed many mountains with tads, thads, thadz, thed, ted, duff, although i only had the privilege of being in the same group as he during our second training climb up the perilous sky trail in mount mariveles, and when i was his group leader during the 2k6 2nd induction climb up mount pulag. i remember rather vividly how the two of us worried sick about our other companions who didn't arrive at the tarak ridge campsite, and we spent our vigil under the kitchen tarp, getting to know each other. tads himself arrived well after 7pm, and we didn't manage to cook dinner because none of our ingredients were complete: we only had the coconut milk but not the meat for our thai garlic pork, and i couldn't whip up an omelet with just eggs, and no tuna. we were going hungry, and all i had left was a bottle of gin. tads, who had stopped drinking due to some intestinal issues, still had some peanuts. we munched on the pack while we eagerly awaited signs of some late arrival. i remember ribbing tads about his educational evolution, how it resembled the march towards nirvana, going from la salle, then to ateneo, and eventually ending up in UP, where he was also pursuing his MA in anthropology. had tads been any more shallow, who basked in the notion that a person's worth is directly proportional to the school he attended, he would have jumped on my joke and agreed. but he didn't. rather, with much humility, he said that he didn't move to UP fine arts because he felt it was a better institution. rather, that he was kicked out of ateneo's management engineering program. 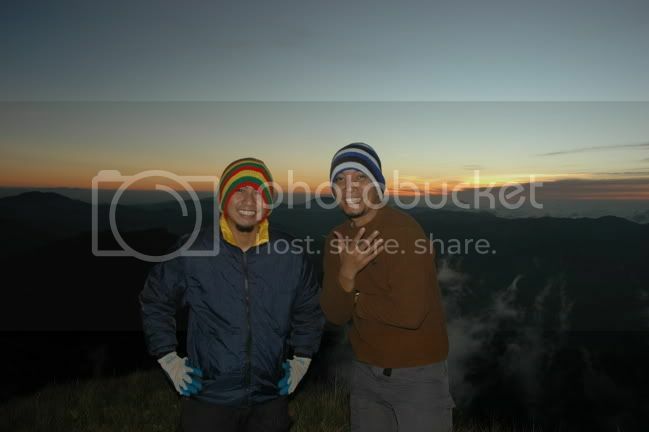 many other climbs took place meanwhile, but i only got to share moments with him again while freezing temperatures were crawling into the seams of our clothes on the saddle below mount pulag's summit. he again refused to have even a shot of the expensive vodka i had taken up with me, but volunteered, nevertheless, to be tanggero. and he was pretty good at it, i would suppose, since he wasn't intoxicated -- although he didn't require alcohol to be witty, sarcastic, acerbic, and piercingly funny. his comments about things mundane and trivial were always spot-on, and anyone who is any less intelligent would probably not get it. i'd like to think i am near his league, because i often found him deliriously humorous. admittedly though, we are opposites in many ways. he has this quiet reassuring presence; he doesn't feel the need to be at the center of attention, content in sharing his bizarre observations with just one or two persons. he needn't raise his voice to be heard, because people will offer to listen, and he has this sunny disposition, with a smile that could illuminate everyone's faces around him. when tads went missing on sunday afternoon, and i was informed of the situation while feeling helpless and stranded in camarines norte, i had conjured images in my mind of my friend cooped up in a cave, or washing ashore on an uninhabited island, not appearing in most navigational maps. it was going to be an interesting story of survival, i was most certainly sure. and despite the terrible terrible news that came soon thereafter, i refused to let go of hope. my friends sped off for zambales to help in the search and rescue and i felt awful i couldn't at all be of any assistance. on wednesday, i received updates that tads had been found by fisherfolk, floating on the south china sea, near the island of hermana mayor, two hours from the shores of santa cruz in the province of zambales, only less than 20 kilometers from the hundred islands. tads traveled a great distance to get to where he was found. my friends rushed to the town, first to identify his body, and second, to bring him home. 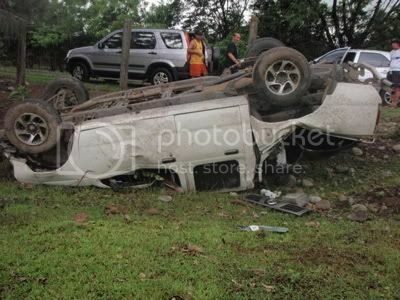 however, cris was pursued by michael fajatin of GMA news, and in an effort to lose the vehicle, cris's pick-up skidded on a sharp and slippery curve, rolled over twice, crossing the opposite lane, crashed through a barb-wire fence, and finally stopped upside-down. it was a total wreck. neri managed to crawl out the window, only to find GMA's camera man taking videos instead of helping. when this happened, janice was left with the duty to accompany tads's father and cousin to santa cruz. they stood on the shore of a beach, and amid much beauty and drama, the small boat that carried tads sailed in while the sun was setting. tads was covered in a woven mat, but from the distance, his right arm was exposed, and it was unmistakable: he was still wearing his orange happy group shirt, and the AMCI patch was clearly visible. it was an exhausting ordeal for janice and lui, having to deal with corrupt and lackadaisical local policemen, and a bureaucracy that would have added pain to the family's grief, rather than offer comfort. she was there with tads at the morgue for a few hours, and helped convince tads's father to explore the possibility of cremation. the other option was to encase tads's body in cement. so it was rather symbolic and also literal for janice to choose to sing imago's "sundo" during our memorial service for tads. on request of his family, we decided to make it a tribute filled with happiness and joy (his dad's words were: "kelangan paghandaan yung program. masaya tayo sa sabado ha. party tayo."). they wanted us to resonate the kind of life that tads lived, particularly when he discovered mountaineering, and mountaineering found him. 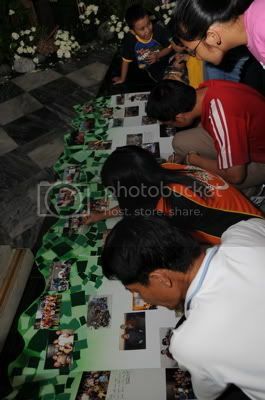 jason, lui and i worked together on a collage with pictures i found on my album, and allowed people to write messages. i think it was a testament of how much tads has positively affected all of us. the program, which maida and JC hosted, was light, full of laughter and smiles, and far from mourning. we were channeling a bit of tads in all of us, in a way. many of his batchmates showed up, most of whom wore the skyblue shirt tads loved to wear, and which he insisted we should always be proud of (i thought i had disposed of the shirt immediately after training, although i discovered it in my closet). during the second song performed by janice, with accompaniment from carlo, joven, and jason (plus back-up vocals from me, haha), we started the lyrics of "paglisan" encouraging tears, but ended it with laughter. all throughout the ordeal of trying to locate tads, the family had always been very positive, so much so that they were themselves the source of strength for many of us. we didn't want to disobey their wishes, nor destroy the mood that they'd set. several people spoke: mountaineering buddies, former classmates, colleagues and officemates, family, a fraternity brod, including tads's special friend -- a mystery girl insofar as all of us were concerned, and i would suppose we were ourselves a mystery to her. after the program, tads's family -- his parents, his aunt, his nephews -- thanked us for all our efforts. i wanted to apologize, in a way because i felt they were not enough. 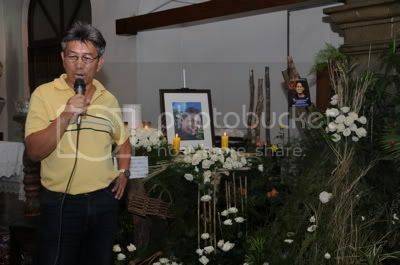 but someone said that if even half of the people present at tads's wake attended his funeral, he'd be happy. 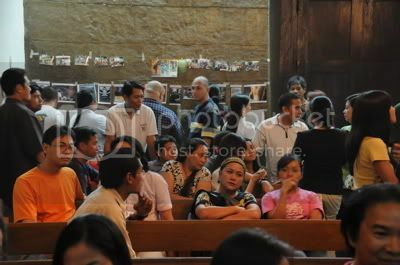 i have said many times that i do not like to go to wakes, but the energy i felt at the don bosco chapel was different. death is a subject that i hardly touch on, but i would want my own funeral to be something like it: no open casket. i always find it utterly strange for people to approach a casket and view anyone's remains. instead, i'd like the place to be filled with stories and photographs of the wonderful life i've chosen and lived. i would like everyone to exhaust their tears outside of where my service would be held, so that when they see each other during my wake, they'd just be sharing anecdotes of how i never took anything seriously, but also how i pursued my passions with such fervor. the past weekend has been terribly exhausting for me, and i delayed on writing about anything because i felt i had to rest my emotions, as well as my physical body. nonetheless, i had to submit myself to this exercise so i can move on. writing is therapeutic for me, and i know that tads, although he never had such an active online life, knew of my blog. he once told me: "o, baka i-blog mo na naman yan!". i'm sorry tads that although you were never one to seek attention, i just poured a lot of effort to focus on you. but in doing so, my intention was never to write a page, close the book, and eventually forget. rather, i wrote a page and placed a bookmark. some time in the future, whether sooner or later, i will open the book again and reminisce, rekindle your memory. you've taught me (and others, i'm sure) a very valuable lesson. but more than that, you've provided us with a lot of inspiration. your sacrifices are not for naught. i'll see you at the summit! "neri managed to crawl out the window, only to find GMA's camera man taking videos instead of helping." Kung minsan, the media deserves to get kidnapped by the abu sayaf. grabe nainis nga ako when i found out about this. kapuso pa naman ako. pero yang si michael fajatin, dapat maparusahan!